The moment you've been waiting for has finally arrived. 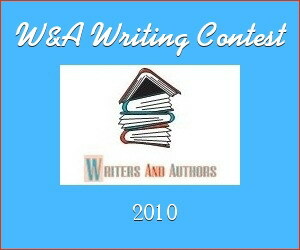 The W&A Writing Contest begins! The deadline for submissions is 31st July. Entries will then be posted to the website and the public will vote for their favourites. The judges (members from different areas of the writing industry) will then pick the winners from the top 3 in each category. Winners will be announced on the website on 16th August. There will be two categories; short story (max 1500 words) and poetry. Pieces should be unpublished and in English language (Both American and British English are fine). No age limit. The contest is open to all (except the judges and prize givers). Submissions should be sent in the body of an email (no attachments please) to writersandauthors@yahoo.it with 'W&A writing contest' in the subject line.